St Vigeans is a small village on the west bank of the Brothock Burn a mile north of the centre of Arbroath. 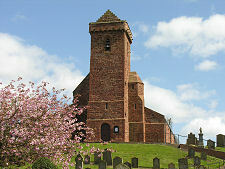 It is dominated by a 40ft high mound topped off by St Vigeans Church, built of a striking red stone. 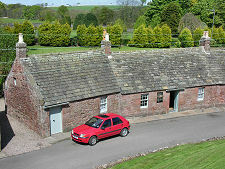 Opposite the base of the mound stands Kirkstyle Cottages, a curved row of cottages. 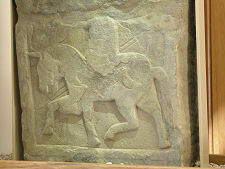 Two of these have been joined together to form the St Vigeans Museum of Carved Stones. This is home to one of the finest collections of carved stones from the Pictish and early Christian era to be found anywhere in Scotland. 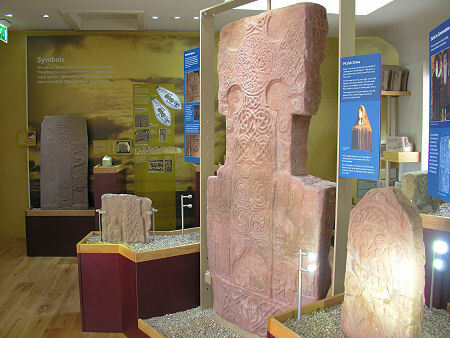 Note that the museum is only open by appointment with nearby Arbroath Abbey: see the contact information on this page. 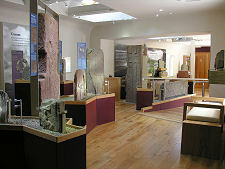 The museum reopened in 2009 after a major renovation, during which the museum's stones were removed to Edinburgh for cleaning. 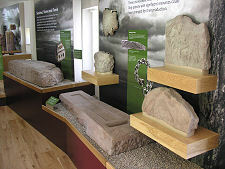 Visitors are recommended to approach the museum from a junction on the A92 Montrose road near the edge of Arbroath. From here brown direction signs lead to a car park from which the museum is just a short walk across a stone bridge built in the 1600s and now open only to pedestrians. 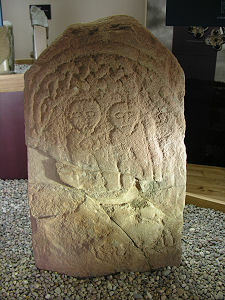 The story of St Vigeans probably began some time in the 700s with the foundation of a Pictish monastery dedicated to Saint Féichín, an Irish saint who had died in 664 and whose name was sometimes Latinised to St Vigeanus. There is a degree of supposition about this, but the theory is that some of St Vigeans' relics (i.e. his bones) found their way to the monastery here, which as a result became a centre of pilgrimage rivalled at the time only by St Andrews. Little except, perhaps, a few architectural fragments among the stones in the museum, remains of the church that would have stood here at the beginning of the 1100s. 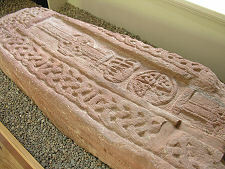 The importance of the monastery at St Vigeans, if it still existed at the time, diminished dramatically when King William I or William the Lion founded Arbroath Abbey on site a mile to the south. The process was completed when he granted the church at St Vigeans and all its property to his new abbey. St Vigeans Church seems to have been largely rebuilt at the end of the 1100s or early in the 1200s. 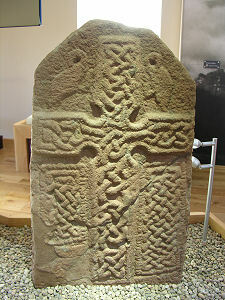 The area around the old church must have been dotted with large numbers of carved crosses and other carved stones. 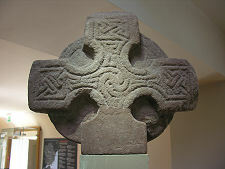 These included many dating back to the era of the Picts, the people who had governed much of northern Scotland for over five centuries but who had been subsumed into the Kingdom of the Scots by Kenneth I in the mid 800s. All these stones from around the site seem to have been simply gathered up and reused as building material to help construct the new church. In 1871 the church minister, the Reverend William Duke, engaged the architect Robert Rowand Anderson to restore and enlarge St Vigeans Church. As the work progressed, a steady flow of carved stones started to to be recovered from the decaying fabric of the old church. As they did so, Duke recorded them and later placed them on display in the porch of the church. They remained there until 1960 when the collection was placed in state care, and moved across the road to Kirkstyle Cottages. 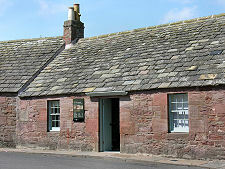 Today the collection is in the care of Historic Environment Scotland. Seeing the newly cleaned stones in their newly restored museum is a remarkable experience. In all some 38 carved stones are housed here. 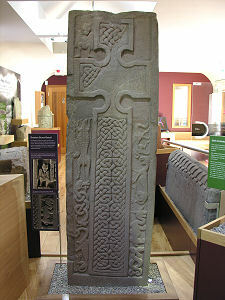 They range from the very large to the very small, and from grand Pictish symbol stones to fragments. What really makes a visit special is the way the stones have been displayed and, especially, the quality of the lighting, which shows up every aspect of the carving in extreme detail. 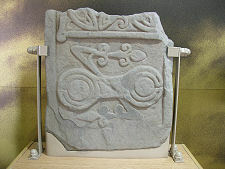 Of the stones themselves, five carry symbols typically found on Pictish stones. Nine more are grave markers of various types, or parts of grave markers. Eight more stones depict saints, including one showing St Anthony and St Paul breaking bread together. Five more stones seem to have been carved from the same type of stone at the same time, and are thought to represent a group commissioned by a rich patron to dignify a new shrine for St Vigeans' relics. Eight more of the stones are architectural fragments of the early church that stood here in the 1100s. 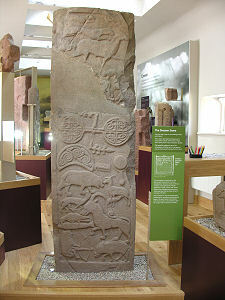 In many ways the highlight of the collection is the Drosten Stone, a Pictish cross slab standing 182cm high by 53cm wide and illustrated at the foot of this page. 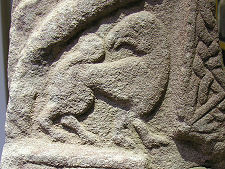 This is believed to have stood at the entrance to the monastery at St Vigeans to keep evil at bay. It has been broken into three at some point, and the middle part remains missing. The larger part was reused as paving in the church, while the smaller fragment was built into a set of stairs. It is still possible to see just what a magnificent piece of work it was. 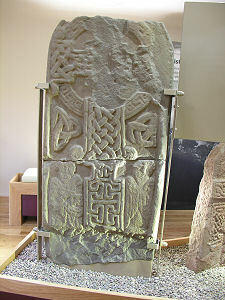 The cross face of the Drosten Stone carries a long cross surrounded by various fantastic creatures, including a demon to its top left. 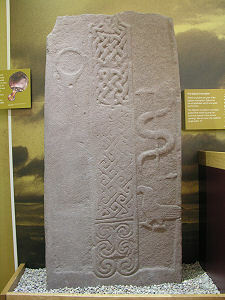 The rear of the stone carries a mixture of Pictish abstract symbols and carvings of figures and animals. Two hounds are shown pursuing a stag in one place, while a bowman is shooting a boar in another. 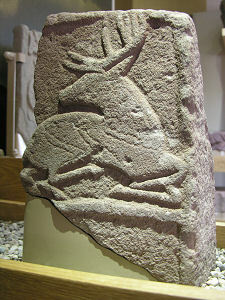 Carvings of a bird, a bear, a unicorn and a deer suckling a fawn are also shown. 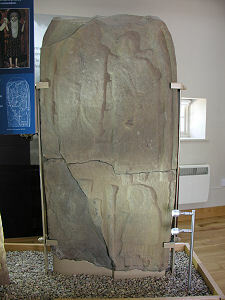 The most unusual feature of the stone is a a small panel on its side carrying the tiny carving: "DROSTEN: IRE UORET ETT FORCUS". Opinions differ as to its meaning, but it may well mean "Drosten, in the reign of Uoret and Forcus". It is tempting to wonder how many more treasures there are hidden away in the standing structure of St Vigeans Church: perhaps some day someone will come up with a non-destructive way of finding out. Meanwhile, it is worth noting that not all the stone treasures around the church have made it into the museum. 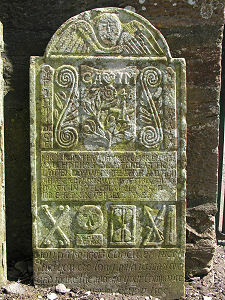 Some of the gravestones lining the churchyard wall are especially fine, notably the one illustrated on this page dating from 1746. Perhaps the mason who carved it was a direct descendent of one of those involved in carving the stones in the museum, eight or more centuries earlier. It would certainly be nice to think so. Saints or Monks... or Aliens? Tel: 01241 878756 (Arbroath Abbey).